Introduction: Daiwa introduces the Capricorn which ushers in a new design philosophy from fishing giant, Daiwa. Part of their new HardBodyz lineup of reels, the new Capricorn delivers a fresh design, upgraded materials, and innovation at a price that is surprisingly reasonable. Impressions: Anglers who fish with both Daiwa and Shimano reels can truly understand the difference in design, construction, and feel of the two products. Daiwa has always been known for their innovative designs, and tournament quality products. The new "HardBodyz" line of reels takes a real departure from the traditional Daiwa design concept that most of us have grown so familiar to. In the past Daiwa reels like the Emblem and Team Daiwa series all sported an easily recognizable compact teardrop like shape, coupled with Daiwa's traditional breakaway handle. The Capricorn changes all this with a new compact and narrow profiled body and a machined aluminum handle arm. Apart from these easily recognized changes the Capricorn comes complete with features that normally would be found in only the highest end reels. Daiwa fans can rejoice that while there are many changes in the HardBodyz lineup Daiwa continues to offer their proven ABS (Anti Backlash System) spool design. Design: The Capricorn's new sleek body is made of aluminum alloy and is coated with a attractive matte finish that resists glare and heat buildup well. Unlike past Daiwa spinning reels that have a glossy appearance and feel somewhat slick, the Capricorn almost feels like a magnesium built reel. 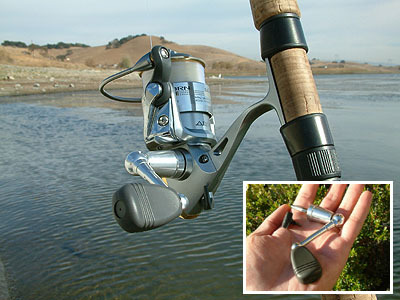 Most surprising was the use of the new machined aluminum handle instead of the traditional Daiwa breakaway. The new handle feels more solid, and is definitely an improvement in terms of aesthetics. The materials chosen for the implementation of the Capricorn are impressive. With liberal use of lightweight aluminum and a reduction of plastic parts the Capricorn feels like a premium reel. The only plastic found on the Capricorn are the bail return arm, anti-reverse switch, and handle screw-lock. While the reel certainly looked like an improvement over the old designs our field tests would how how well this new reel would perform in a range of applications. Field Tests: Matched up with a Med-heavy GLoomis rod we tested the Capricorn in a slew of tests that included both shore and watercraft fishing applications. Casting: Daiwa spinning reels have always had great casting performance thanks to their ABS spool design, and the Capricorn lives up to its pedigree. The Capricorn casts light to medium lures with accuracy, and can shoot heavy crankbaits a great distance with ease. While the overall reel dimensions are slim the handle is contoured to feel comfortable between your fingers, even after hours of casting. 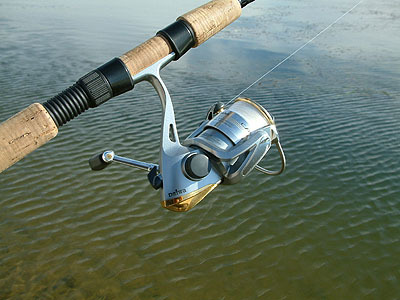 To further reduce weight while casting the reel is attractively hollowed out in the handle and rotor sections. Retrieving: We were surprised that Daiwa implemented its "Air Bail" into a reel of this price. This tubular stainless steel bail has a much wider diameter then traditional bails to offer more positive line pickups and fewer line snags. (Notice how the bail is joined and contoured) Typically this type of technology is reserved for premium reels like Daiwa's TD-S/Z and Shimano's Stella. With a gear ratio of 4.7:1 the Capricorn isn't the fastest reel on the water, but it is among the most flexible, and does equally well slow crawling plastics and swimming all but the fastest traps. We were afraid that with the new streamline design Daiwa would be forced to use smaller and less reliable gearing in an effort to shave off size and weight. We are pleased to report the Capricorn actually feels more solid from lock to lock then the older Daiwa reels, and produces steady and consistent fighting power with each turn of the handle. Though the Capricorn only has 5BB you would swear it has more, as it delivers a silky smooth retrieve. The infinite anti-reverse is among the best we have ever tested, and offers no back-play at all. While fighting even large bass the Capricorn exhibited no flex in the rotor or body, and began to inspire more and more confidence in this new design. The Drag: There are drags and then there are Daiwa drags. 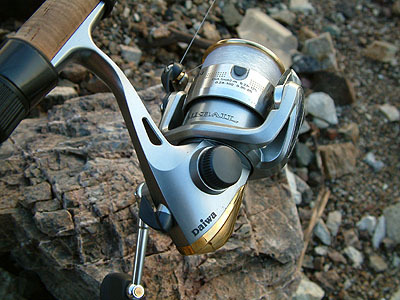 Few sounds bring more jubilation then the steady clicks of a well tuned Daiwa drag. Unlike many reels that put a spring and pin on each spool Daiwa continues to use a large coil spring (mounted on the reel, not the spool) that comes in contacts with grooves on the spool interior that combines with pressure from the drag washer system to deliver drag pressure from 0-100%. The top of the drag control is silk screened with the words "micro adjustable," at it is. 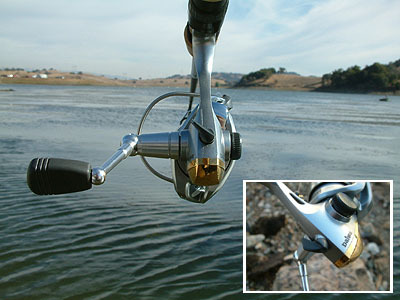 We were able to very finely adjust the drag quickly enough to compensate proper drag pressure even while fighting fish. 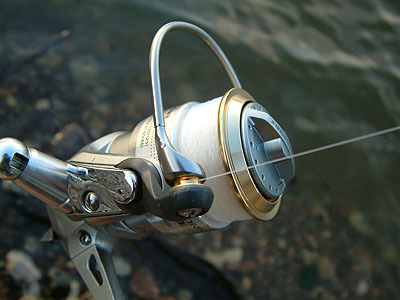 The Bail: The Air Bail itself is stronger then the wires used by most reels, but the most interesting aspect of the Capricorn is the implementation of a new bail locking and disengaging system. Have you ever been fishing with a reel and go ahead to cast hard only to have the lure spring right back at you because your bail snapped back to the closed position? Daiwa's BailSafe� system locks the bail in the open position to prevent accidental closing on outcast. This system works so well that even when we tried to disengage the bail deliberately with poor casting motions the trademarked design never failed. The second, and most welcome improvement of the Capricorn is the internal bail return system. 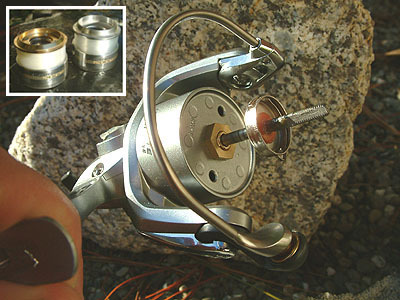 On old Daiwa reels like the TD-S when the bail was opened a small switch would come out of the rotor, this switch would have to come in physical contact with the arm of the reel to disengage the bail. The new system puts the entire system internally, resulting in a much more accurate, fluid, and resistance free bail disengagement. Competition and final notes: After all our tests Daiwa made us believers in the new "HardBodyz" design. Overall the new features and construction are real winners. With a weight of 9.5oz the Capricorn is fine for a reel of this size. While the Capricorn comes in a smaller 1500 Ultralight size we were a bit disappointed by the fact that the reel is identical in body size, with the only real difference being spool size. Thus the weight of the 1500 is identical to the 2000 at 9.5oz, which is not very aggressive considering some of the new ultra light competition. 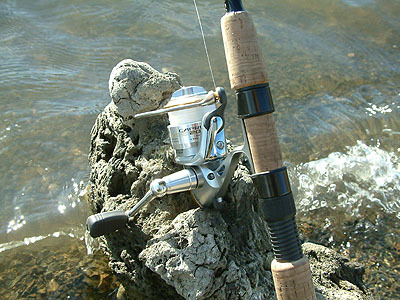 But if you are looking for a good bass spinning reel the 2000 is a great choice. Conclusion: Daiwa fans can breathe easy as the Capricorn delivers the same spool and drag system in a new slim package that will not disappoint. With a new sleeker, sexier, and lighter design the Capricorn delivers silky smooth performance thanks to even more finely cut gearing and a super solid aluminum chassis. Daiwa really put thought into the design and manufacture of this new offering, and with all the features and quality packed into the Capricorn it is a great reel for the price. Not only does the Capricorn live up to Daiwa's tradition of quality but in many ways surpasses the previous designs in terms of refinement, definitely worth checking out if you are in the market for aggressively priced tournament ready spinning reel.